I am exhausted. Well, actually, I’m not so bad now, but at work I was DRAGGING. I ended up staying up to watch The Daily Show last night, and a little of The Colbert Report, and I swear, as soon as my head hit the pillow to go to sleep, The Munchkin woke up and needed to be fed. I didn’t get to sleep until a little after 1am. And then, he woke up at 4:30am, and would. not. sleep. He stayed awake until after 6, which was pretty much when I needed to get up! Ugh. I ended up sleeping in. I didn’t have time to shower, and I was late for the sales meeting. Double ugh. When I got home though, I was determined to have the night be productive. I strapped my little man’s bebePOD to a kitchen chair, and then strapped him in, and started to make dinner. Or, I was going to, except that he was fussing like CRAZY. 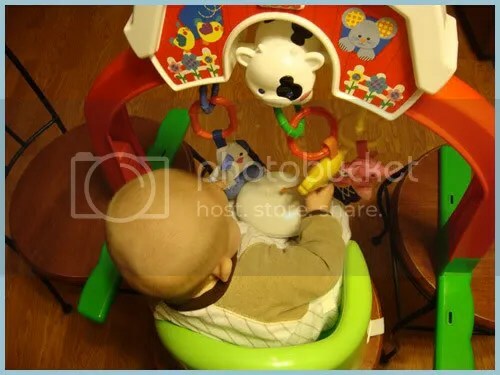 So I dragged two other kitchen chairs over; one on either side of him, and plopped his farm toys on the two new chairs, so the toys were dangling in front of him. Happy baby! I was able to make dinner in peace. I couldn’t eat in peace though, because he started to get fussy anyway, but hey – you can’t win them all. I got the Halloween mess from hell in his nursery all cleaned up too! I originally put The Munchkin in his bouncy chair, but he started to cry, so I brought the Johnny Jump-Up upstairs and hooked that in his doorway and plopped him in. Worked like a charm! I was too tired to do anything else after all that, but all in all, a good night!